ONE Week only!! 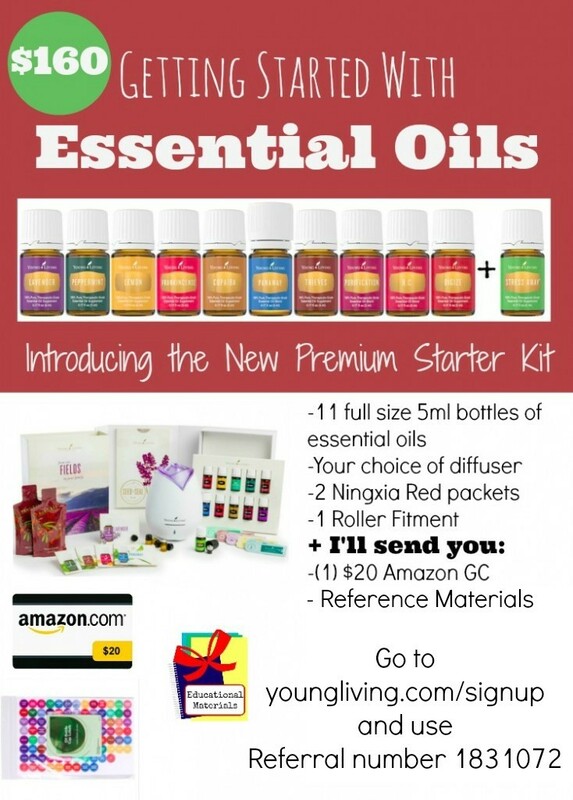 Special on Young Living Essential Oils Starter Kit! When I first found out I was pregnant last Summer (in the middle of allergy season!!) I wanted to find a natural way of easing my ‘nasal discomfort’ and a friend of mine suggested Young Living Essential oils. I have always been hesitant of things like that as I don’t like gimmicks or things that seem to just be a “fad”. I’ve been using the Essential Oils for over a year now and LOVE THEM. You can find a natural remedy to so many different things. From seasonal nasal discomfort*, soothing the discomfort of burns*, supporting our immune systems*, promoting proper stomach digestion, and even bug spray! (And lots lots more! Have you heard the saying “there’s an oil for that”? There really seems to be!!) Oh and don’t even get me started on helping to relieve stress… I SWORE by Stress Away during the 6 months we spent in the NICU with Oliver. These are not a “new trend” or something untried, people have been using essential oils for thousands of years! I would be remiss if I didn’t tell you about this, AND as this Wheel n Deal Mama… I am offering up an INSANE deal if you want to check it out!! – Amazing Reference Materials to teach you how to use your oils – I promise, they are incredible! -a set of Essential Oil Labels ($3.95 value) to keep your oils organized! -a $20 Amazon Gift Card!! *Your freebies will be mailed out by me personally 30 days after you order your kit. You must be currently enrolled under me (Laura Dieckman, member ID 1831072) to qualify for the freebies. Best thing? You get ELEVEN 5 ml bottles with this deal. Several people always ask each time I talk about this starter kit if it’s just the samples. Nope, you get everything in the picture above with your kit including the 11 5 ml bottles of oils! If you are ready to buy a starter kit, then be sure to sign up as a wholesale member (with one of the premium starter kits) through the instructions below by December 24th to take advantage of these freebies! 5. Select which starter kit you want to get. My recommendation would be the Premium Starter Kit (and that’s the one where you get all of the freebies!) Those are the oils that I use almost every single day! 8. After you sign up, send an email to wheelndealmama@aol.com mentioning the code “WHEELNDEAL” and letting me know that you signed up through this promotion so that I will know to send you your freebies! Feel free to ask any questions in the email and I will also help you find the information that you need. IMPORTANT: This promotion is only available when you sign up with the sponsor ID and enroller ID as #1831072. Also, if you recommend this promotion to a friend (or group of friends) and they sign up too through this promotion then please let me know so that you can get credit for referring them.